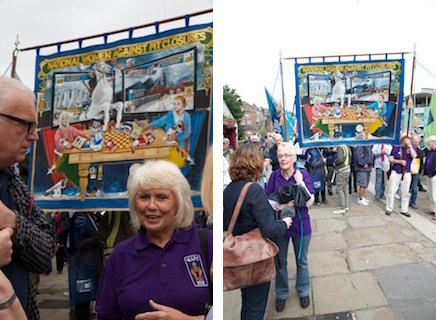 I have attended the Durham Miners Gala for five years and I have been fortunate enough to have documented the event over three years, first with artist Margareta Kern in 2012, then with artist Alan O’Cain in 2013 and with photographer John Perivolaris in 2015. I missed this year’s Durham Miners Gala due to a back injury and thought it might be good to reflect on the process and share some of the voices and images. This short blog gives a flavour of some of the conversations with banner holders and why being present and carrying the banners is so important to them. 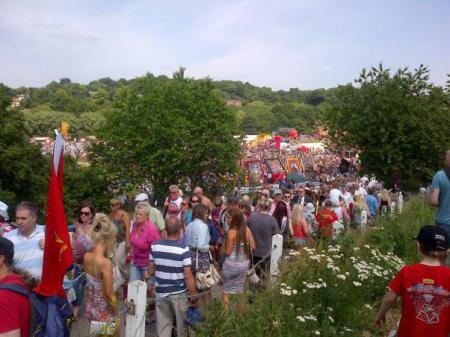 As the daughter of a miner and trade unionist, (who was branch secretary for the Steelworkers Union in Consett, Co Durham and then branch secretary for NUM Warwickshire coalfields from 1970 and who ‘retired’ after the 1984 strike), I was keen to know how people feel about the Gala and why they return year after year and what if anything it means for labour politics and trade unionism. Here are some of the voices of the banner holders accompanied by images by the artists I worked with. It is always a privilege to attend and speak with the banner holders. Speakers at the Gala, across the three years we recorded and documented, include Ed Miliband, Ricky Tomlinson, Bob Crow, Owen Jones, and Jeremy Corbyn. Time for some women labour politicians I think! Anne Scargill was walking in front of the banner and the artist who created it, Andrew Turner, tells me about it. Some of my banners are quite famous now. You’ve seen the Selby one which the Coal Board banned, and then I did one for the Steelworkers, a massive big one that’s about 12 feet tall and eight feet across. I’m from a mining background, so this is where my loyalty has always been, my father was in the mines. My grandfather campaigned for Kier Hardy. I am dying to see the women, they have been so good to me, Anne and them, they are just absolutely splendid. I think they’ll want me in the front. It’s going to be blessed, they have chosen it to be blessed at the Cathedral. Here we go for the women of the working class! I said hello to Anne and asked her what being here today meant to her. Today means a lot to us, obviously we brought this new banner, our old banner was too historical to keep getting knocked about, so Andy Turner, who is a famous banner maker has been painting this for three years. 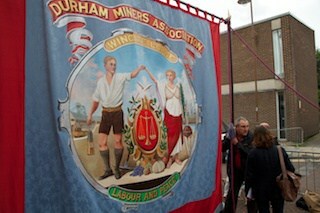 He said, “I’ll do you a union banner” and I said “will you?” I’ve come to Durham for about the last thirty years. I’ve seen it with a lot of people and then hardly any people in the dark days when they closed a lot of the mines down, and now it’s an international labour day isn’t it, you just look round here, people with banners from every trade union, every movement, left wing of course, and I am really, really pleased because now we need a lot more of us because they are going to take off us pensioners and they are going to make themselves richer, which they are doing at the moment and us poorer, so we’ve got to get organised. We’ve got to move on but we’ve got to be united in our struggle – which we just sang in our song – united by the struggle, united by the path. They say united, divide and rule, we don’t want that. I’m really proud of our banner, he’s done a good job, because it has history on it because it’s very political, which is really important, it is yes, and we hope we get the message on our banner across to the people. This pit here, Wingate Colliery, was one of the first to close – it closed in the early 60s so I can just say remember it. 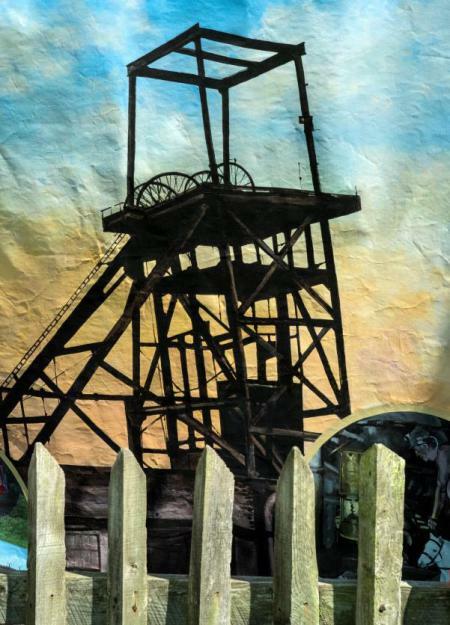 I worked at Easington Colliery, it was one of the last pits to go in this area – big, massive pit. We worked 6 miles out to sea. Unbelievable, a very wet pit, it was always dreadful conditions. When you think about it now and you see the other side of the coin, you wouldn’t go back down. You know, some terrible, terrible conditions. What does it mean to you to be here today? Oh it makes me as proud as punch, I love it. It sets the hairs stand up on the back of my neck, I love it, I never miss, never miss, I can’t remember the last time I missed. It is one of the most important days in the calendar for me, Durham Big Meeting. I really enjoy it. I meet a lot of friends, a bit of craic. People I haven’t seen from year to year even. I enjoy it, yes it’s great. 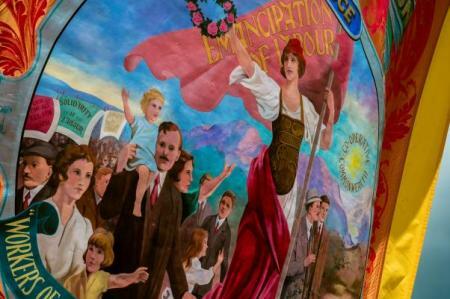 The banner represents the miners and the families for generations – and we’ve got no collieries left but we’ve got the banners left and this will remain as our heritage. The labour and the peace: The labour is the men that worked in the mines producing coal for the shipyards, the shipyards built ships to keep the country going; and then the peace was the miners holiday, which was the day of peace when all the government ministers never fought, they all came to Durham and were friends for one day of the year and then the next day they were back in government fighting with each other. It is the labour movement. I am hoping that Tony Benn is here today because there’s a new banner been made and his photo is on it, so I am hoping he will see it with our labour leader which is the first time we have had a labour leader here for about 10 or 14 years – he is up on that stage today and he is going to get a shock now he sees how many followers he has got. My father who was in the 1926 strike carries the banner from Wingate with the rest of the fellows, they marched from Wingate to Durham. They were fed by the Salvation Army soup kitchen on that show field and the British Rail felt sorry for them and gave them free passage back to Wingate by train. There you are, there’s a story to tell your grandchildren. That’s devotion, that’s when the strike was on and nobody had anything, so they came here penniless, got fed and went home without money, and yet they managed – it is, it’s devotion, the miners here today and their families, grandchildren now come and it reminds them of what their grandfathers used to do many years ago and the conditions they worked in. 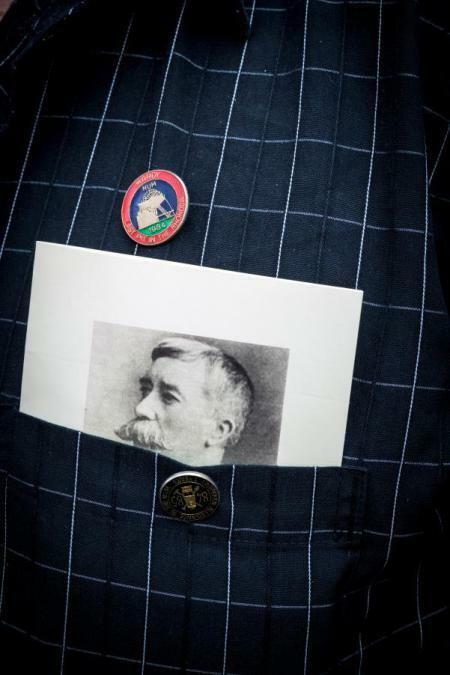 Two images, the image on the back is of Durham Miners Headquarters and the 3 guys on the front, obviously A.J. Cook, Peter Lee and Kier Hardy. Before my time thankfully, trade union men and what have you and I have never missed once since July 1978. I worked for thirteen and a half years down the mine at Herrington. It’s quite a day for myself, second only to Christmas morning. Definitely, and trade unions, I am a big believer in unions. Like I say, you’ve got to instil it in the next generation who is following on to keep the tradition going because it would be a shame if it ever petered out. From a personal point of view, I like to meet people who I used to work with. I mean I left the collieries in 1991, and I meet up with people who I haven’t seen since then and also I’ve got two children of my own, one who carries the banner now and it’s just nice for them to get the feel of the day, what it’s about and it’s a social gathering. I’m very, very proud, when I carry the banner something happens inside me. I’m very proud to do it. I do it every year. I think there is a lot happened since the strike, from a personal point of view, once again, I stuck the strike out for a year, and I couldn’t cross a picket line if my life depended on it, I would rather lose everything. But, we have got people who have come with the banner today, who did go to work for one reason or another, that’s up to them, everybody’s got their own personal preference, circumstances were different and we just had to paper over the cracks and move on. But unions, we need the unions. But why are unions important? Because they stick up for your rights, health and safety is paramount, wages, conditions, depending on what industry you work in, where you come from, you need unions, you really, really need unions, I can’t speak highly enough of the unions. I am a member of the GMB now. I can’t emphasise enough, there is a lot of people where I work are not in the unions, I can’t emphasise enough, they need to be represented by a trade union because, hopefully you might go through your whole life not needing them, but there might be the one occasion when you need them and you depend on them and they are there for you, so that’s all I can say, I can’t speak highly enough of the unions. And the fact that Ed Miliband and Tony Benn are here today together? Great, great, big fan of Benn, big fan of Dennis Skinner. I sound militant now don’t I? But I’m not, I just believe in standing up for my beliefs. This is our day, this is a Durham day, this is her dad’s day, these are all miners, the miners are not anarchists, the miners are people who have dug coal all their lives and went on strike in ‘84 for a full year with no money… and being fed by his daughter… all my friends, Dougie, all miners, the strike was a massive thing in this area, it changed people’s lives, it brought out values of the women coming out and feeding people, the solidarity, and I am not that left wing. I have worked all my life but to see that, it is ours, it is not theirs. That’s theoretical, anarchism, anarchy, they are too far left… its traditional, just human values. My wife’s dad was on strike for the full period, never came out, went all the way through. He is a big union man and he comes in with the banner every year but he has been very poorly, he has had a triple bypass and has been in hospital for 7 weeks and just got out yesterday and he would have loved this. He has never missed the day so we have come for him and he’s a working class man who has real values and traditions. And her dad used to respect the labour leaders who came and then when Tony Blair didn’t come… so for all Ed Miliband’s issues he has still come and showed his face, so that means a lot to the people from the Durham coalfields. 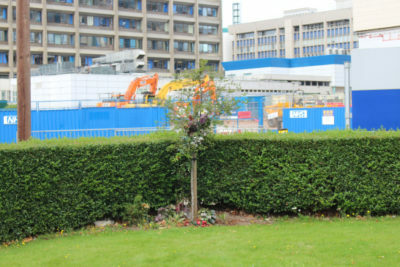 This has a damask silk centre, there’s none left now, and one of our lads in Thornley has done all the paint work on it. We’ve got the Colliery on the front, and at the moment it’s the only banner what’s got a pit pony on that’s going into Durham Big Meeting. So we have the pit pony on the back with the war memorial and the pit wheel. 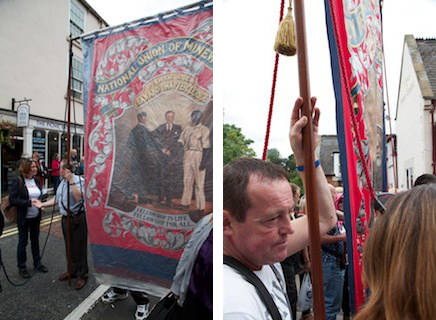 So, as I say, the Durham Miners Association started in 1869 in Thornley, so I class this as the most important banner, because this is where it started. What does it mean for you to be here today? Wonderful, wonderful, it is, I’m steeped in it, I love it. I will be on the balcony this afternoon because I cannot march very far, that’s what I do. Miliband’s on there, there is a lot of security, so as I say it’s just a fantastic day. We’ve got to get these little’uns involved because if we don’t we are all getting older and older. I’m 70 now. It will never die out, as long as I am here it will never die out. I’m taking the back seat. I don’t like to talk about the strike. It is memories, keeping the family tradition going, it was my Dads livelihood. I have come because it is tradition and I am so proud to walk in front of the banner. My dad did get a job down the docks after 1984, inside the ships cleaning. It is my first time in front of the banner and I am delighted. I am Geoff, I was Bolsover Branch secretary and an Orgreave veteran. Lets get back in line. 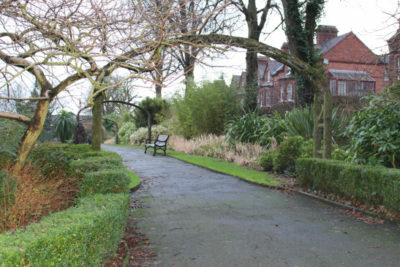 I live in Worsop in North Nottingham. This is a really good banner, a lot of banners went missing or were discarded after the strike. It is our heritage being here. You have to make sure the kids know what happened, it makes me well up. 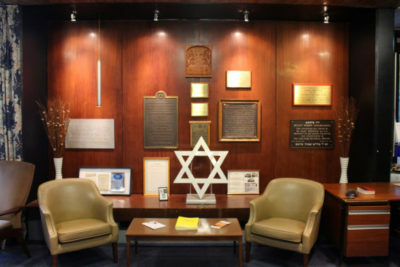 We can’t wipe out history, it must really get on their nerves to have us here year after year. We should never be allowed to forget what these kids dads and grand dads and earlier generations did, and this is our union. I look forward to this every year. I am in Unite now, I was a taxi driver after the strike. We are a political cycling club and we are loyal to socialism, and we demonstrate with Trade Unionists. The banner represents a winged angel designed by Walter Crane in 1903. ‘Socialism for the world’ is the motto, ‘fellowship is life, lack of fellowship is death’ is from William Morris. Most members are trade unionists and a lot went to Spain and fought in the Spanish Civil war, at least four of our members died there. We are committed to socialism, we are fighting for a socialist state in Britain and there should be tens of thousands on the streets, we were demonstrating in Madrid last February and a million people were on the streets. We have members all over the country. This is our second banner. Five years ago we cycled from Glasgow to Barcelona to raise money for refugees. I usually come with my children and its the first year I have marched and realised it is a big part of my heritage as much as Diwali, or religious festivals. It is lovely to see and a sign of strength of socialism under the current government, it is a cultural thing. We have come from Belfast and coming here is to demonstrate solidarity, even though we are in Northern Ireland, a different regime, we are very much part and parcel of our organisation and this is a visible demonstration of that. 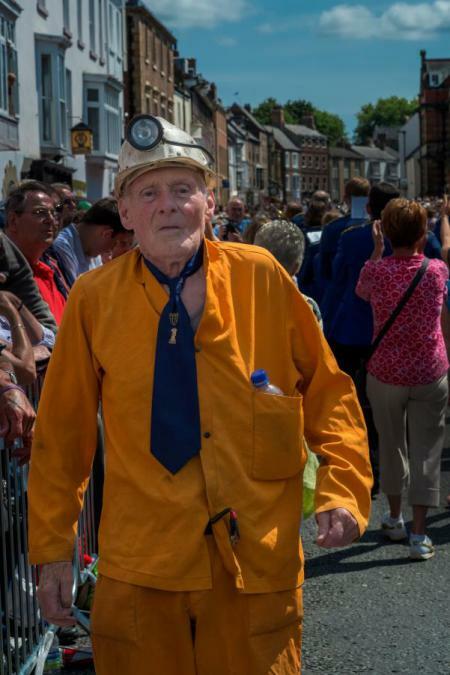 I have noticed how the tradition of the miners villages walking in as a village and that is fantastic to see, the cultural basis that exists strongly and this is a big major day and long may it continue. Ricky Tomlinsons and Bob Crow are speaking today and it will be really interesting. My Dad was a miner all his life. I have come here since I was a small child. So proud. My son carried it last year. I love it, everyone joins in, the atmosphere is amazing, everyone enjoying it but you don’t forget why we are here. I am here because I am proud my dad was a miner, other people will be here for the union and all the things they fought for, all different reasons. Me, I am here just to be proud for what they did. We have two banners, the old one is in a frame in the club and this is a new one to carry. A member of the band accompanying the banner joined in the conversation. 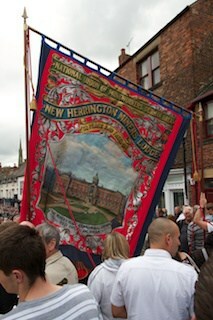 The original banner is overpainted it was originally another collieries banner from 1922. This is a second generation banner made by my grandfather in 1985. The original banner wasn’t like this banner it was different. As time went on pits changed their approach to banners and if a banner went into disrepair another pit would give them an old banner to overpaint. 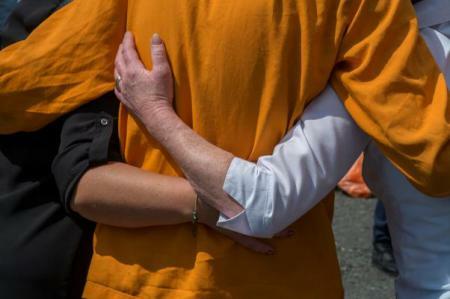 Another example of solidarity. I was born in 1977 and my first day playing in the band was 1989, so I am a veteran now. Based on a banner brought back from Spain we come every year, we have a stall and we share and keep alive the memory and heritage of the men who fought in Spain and to tackle fascism. Ordinary working class people on the rough end of the depression 1930s and there was an uprising of radical politics and socialism. Across Europe right wing and fascist governments were rising and after the military coup in Spain people were worried. One man said ‘if I don’t go and fight fascism I will have to wait and fight it here’. They went because of the British policy of appeasement and ordinary working call people said ‘enough’. We had our AGM in Edinburgh and had a band led by a young Spaniard from Edinburgh. We are commemorating this history. So many from these shores went over to Spain and died there too. We are keeping their memory alive. We are not a party political organisation and do not take party positions, what galvanises us is the rise of fascism. Sir Alfred Sherman was in the International Brigade. Waiting outside the Cathedral to go in and have the banner blessed. I have been carrying the banner for 11 years. It has been replaced twice. We closed in 1983, we held on as long as we could and of course Margaret Thatcher closed us down. I was there 43 years. This one cost 7.5 k and was commissioned in 2009, we have another 2 in the community centre and one in the church that was made in 1920. Our band are from Manchester, I booked the band. They left Manchester at 5am this morning. This is the biggest labour rally in the country. Nowhere else would put this on. Solidarity with the union. It won’t die. The only thing we are frightened on is we are getting older and we want younger people to carry on and carry the banner. A Sefton banner supporter had cycled 2 days from Sefton to Durham at 70 years of age. He had been many times before and is supporting the Gala, community spirit and the movement. We asked him why the banner was important to him. 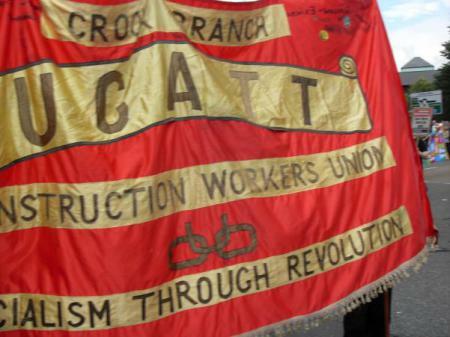 The general labour movement, the trade unions, social services, social justice and the representation of the movement. The Gala is bigger than I thought it would be, it builds you up again being here, when you are fighting everyday, it’s great to come and re-charge your batteries and feel uplifted. 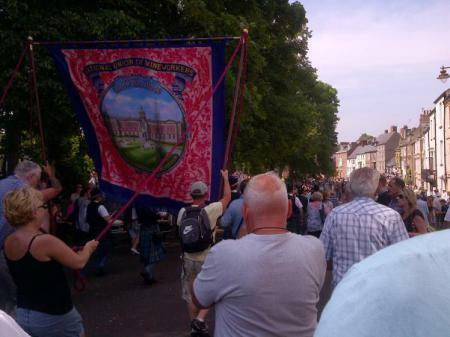 We close this short blog with a beautiful recording from Durham Miners Gala 2015 of The Miners Folk Song. When your mining days are done?